Tears filled Dwi Haris’s eyes as he recalled the moment a violent earthquake shook the hotel room he shared with his family — somehow, he was spared, but he has no idea what has become of his wife or daughter. Mr Haris is among the survivors of Indonesia’s latest natural disaster. 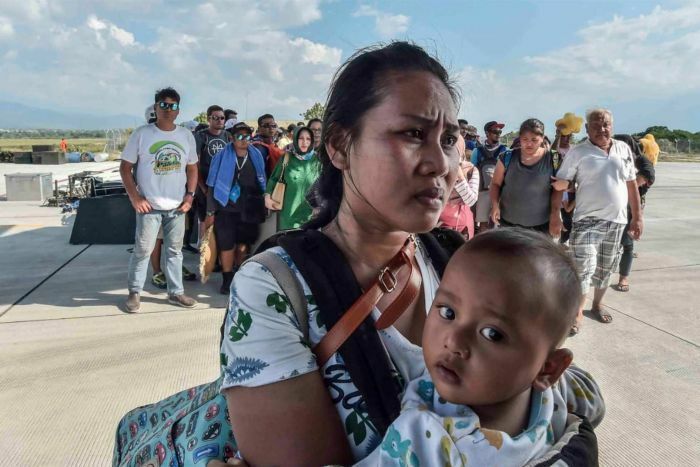 Residents, too afraid to sleep indoors, camped out in the darkness on Saturday while victims recounted harrowing stories of being separated from their loved ones a day after a powerful earthquake triggered a tsunami that unleashed waves as high as six metres, killing hundreds on the Indonesian island of Sulawesi. The head of the National Disaster Management Agency (BNPB), Willem Rampangilei, said late on Saturday the death toll from Palu had reached 420 people, according to news website Kompas. 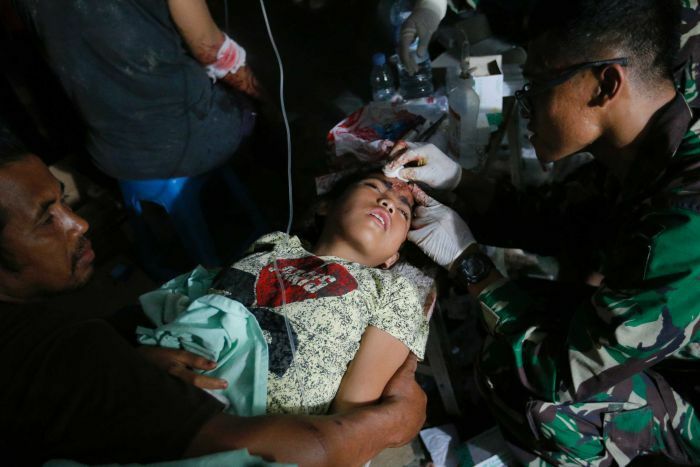 Hundreds of people were injured and hospitals, damaged by the magnitude-7.5 quake, were overwhelmed. Some of the injured, including Mr Haris, who suffered a broken back and shoulder, rested outside Palu’s Army Hospital, where patients were being treated outdoors due to continuing strong aftershocks. He welled up as he recounted the quake. “There was no time to save ourselves. I was squeezed into the ruins of the wall, I think,” Mr Haris said. The family was in town for a wedding. Nina, a 23-year-old woman who goes by one name, was working at a laundry service shop not far from the beach when the quake hit. She said it destroyed her workplace, but she managed to escape and quickly went home to get her mother and younger brother. “We tried to find shelter, but then I heard people shouting, ‘Water! Water! '” she recalled, crying. The earthquake left mangled buildings with collapsed awnings and metal sticking out of concrete like antennae. Roads were buckled and cracked. It was reported as being three metres high in some areas and double that height elsewhere. “We got a report over the phone saying that there was a guy who climbed a tree up to six metres high,” disaster agency spokesman Sutopo Purwo Nugroho said. Mr Nugroho previously said the death toll was expected to rise once rescuers were able to reach surrounding coastal areas. He said other people were unaccounted for, without giving an estimate. Mr Nugroho said “tens to hundreds” of people were taking part in a beach festival in Palu when the tsunami struck at dusk on Friday. Their fate was unknown. Bodies lay partially covered by tarpaulins and a man carried a dead child through the wreckage. 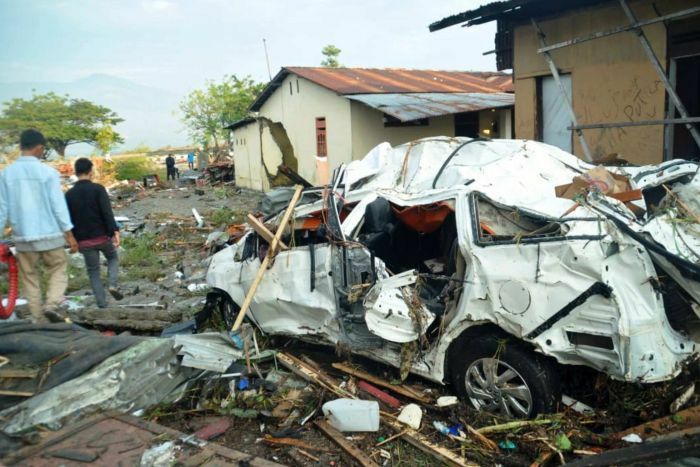 The cities of Donggala and Mamuju, near Palu, were also ravaged, but little information was available due to damaged roads and disrupted telecommunications.